Hamid Beladi is the Janey S. Briscoe Endowed Chair in Business and professor of economics at The University of Texas at San Antonio. 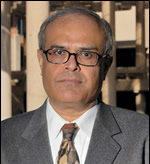 Prior to joining the UTSA faculty in 2005, he was at North Dakota State University. He is the co-founder of the International Review of Economics and Finance and served as editor from 1992-2018. He is the editor-in-chief of the North American Journal of Economics and Finance (since 2010), series editor of Frontiers of Economics and Globalization (since 2006) and associate editor of Review of International Economics (since 1992). He also serves as a member of the editorial boards of several other journals. He is a co-founder of the International Economics and Finance Society (IEFS). Professor Beladi has published extensively in a wide spectrum of scholarly journals including Journal of International Economics, Review of International Economics, Journal of Banking and Finance, Review of Economics & Statistics, Journal of Economic Theory, Journal of Development Economics, Journal of Economic Behavior & Organization, Journal of Mathematical Economics, Review of Development Economics, Research Policy, Economica and European Economic Review. “Multidivisional Firms, Internal Competition and Comparative Advantage: Baye et al. Meet Neary,” (with A. Chakrabarti), Journal of International Economics,” Vol. 116, 2019, pp. 50-57. “Reform, Informal Sector and Extortion,” (with S. Marjit and B. Mandal), Economics & Politics, Vol. 30, No. 1, 2018, pp. 106-123. “Patent Protection in a Model of Economic Growth in Multiple Regions,” (with A. Batabyal), Networks and Spatial Economics, Vol. 17, No. 1, 2017, pp. 255-268. “Union Bargaining Power, Subcontracting and Innovation,” with A. Mukherjee, Journal of Economic Behavior & Organization, Vol. 137, 2017, pp. 90-104. “FDI and Business Internationalization of the Unorganized Sector: Evidence from Indian Manufacturing,” with M. Dutta and S. Kar, World Development, Vol. 83, 2016, pp. 340-349. “Knowledge Goods, Ordinary Goods, and the Effects of Trade Between Leading and Lagging Regions,” with A. Batabyal, Research Policy, Vol. 44, 2015, pp. 1537-1542.